As a Brit, I’m a little ashamed that I’ve allowed my coffee consumption to overtake my tea intake. But I’ve just discovered a cracking company here in NYC that’s encouraged me to get back in touch with my roots. 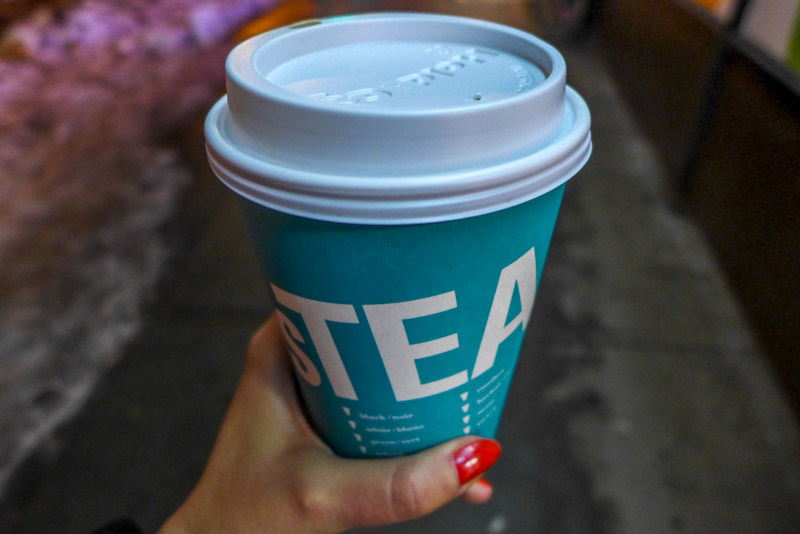 This week, I headed to DAVIDsTEA in Park Slope, Brooklyn for some tasters. I’ve often passed their team (tea-m?) handing out free samples from a tea stand outside (including tasty iced drinks in the summer), but I’d never ventured inside before. 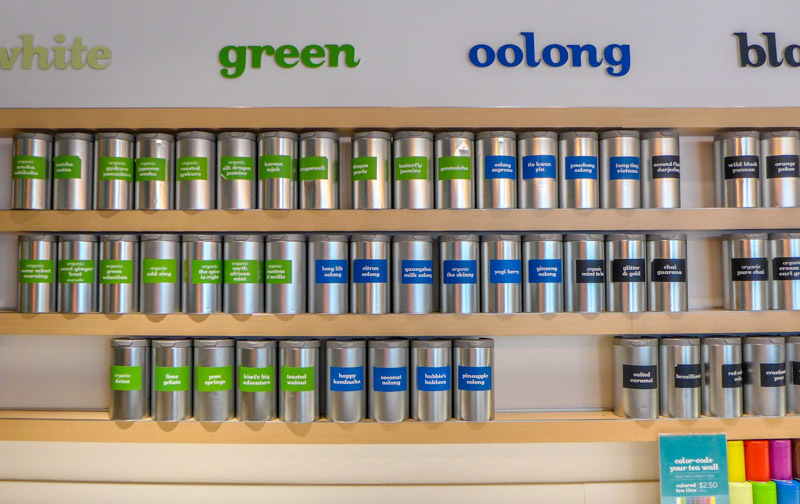 There was something so simple but overwhelming about the store: even though their teas are neatly displayed in color-coded tins along the wall, there are as many as 150 flavors to choose from. I had no idea where to start. Thankfully there were helpers at hand. 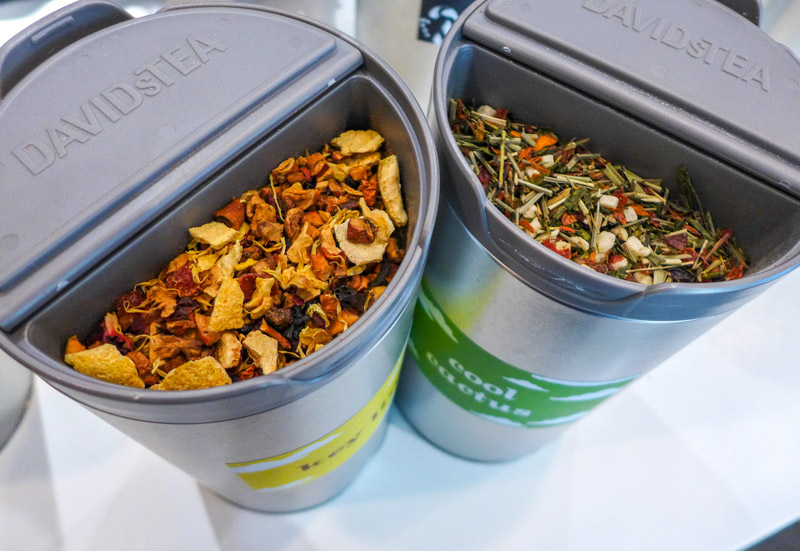 They patiently explained how their teas are divided into types (white, rooibos, herbal etc) and how each container had a little sample pot in the lid so I could sniff and see what I was getting – a great touch. 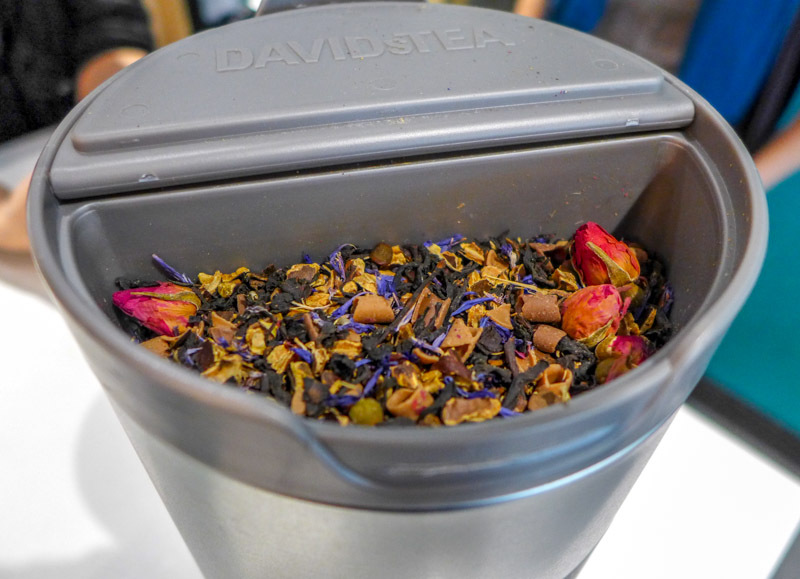 As well as more traditional flavors, there were some very creative choices – apple & popcorn, chocolate orange, creme caramel rooibos. 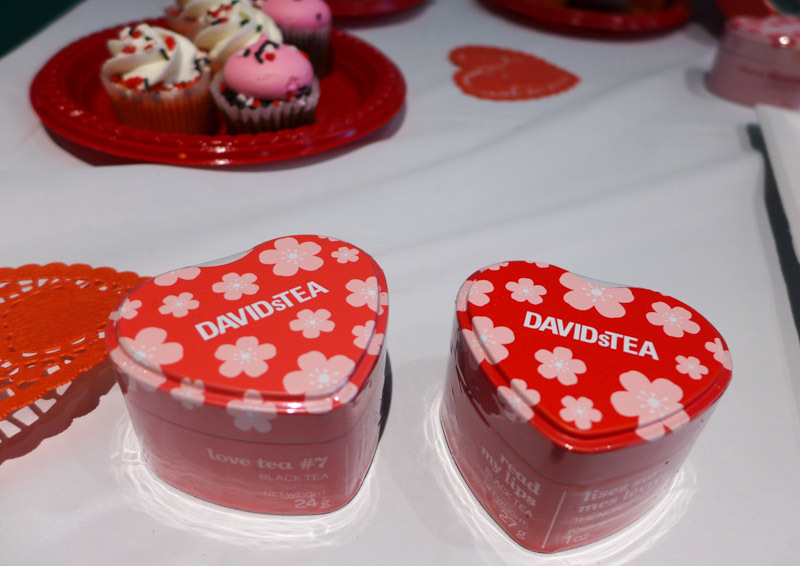 Some other fun flavors included a Christmas tea with mini candy canes, and a special Valentine’s mix of chocolate, rosebuds and black tea. 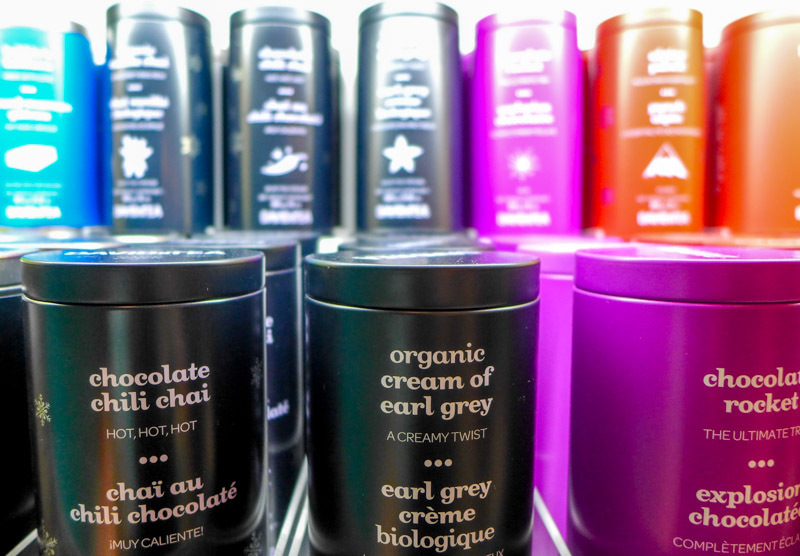 You can buy batches in the stores or enjoy a cup to go. 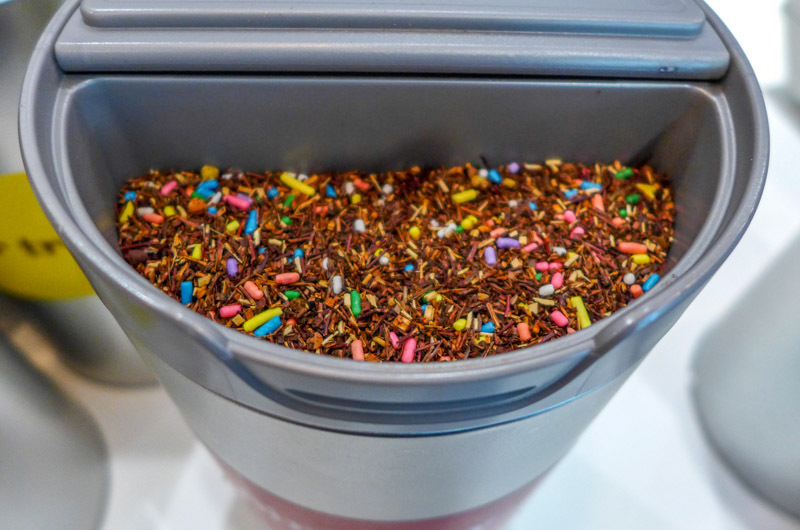 But I went for Birthday Cake Tea: red and green rooibos, honeybush, freeze dried vanilla ice cream and sprinkles (yes, ice cream! and sprinkles!). They popped some of the mixture in a tea infuser and once it had steeped, they added steamed milk to make a tea latte. And – wow. It was so good. Like a piece of cake and a cup of tea all in one. 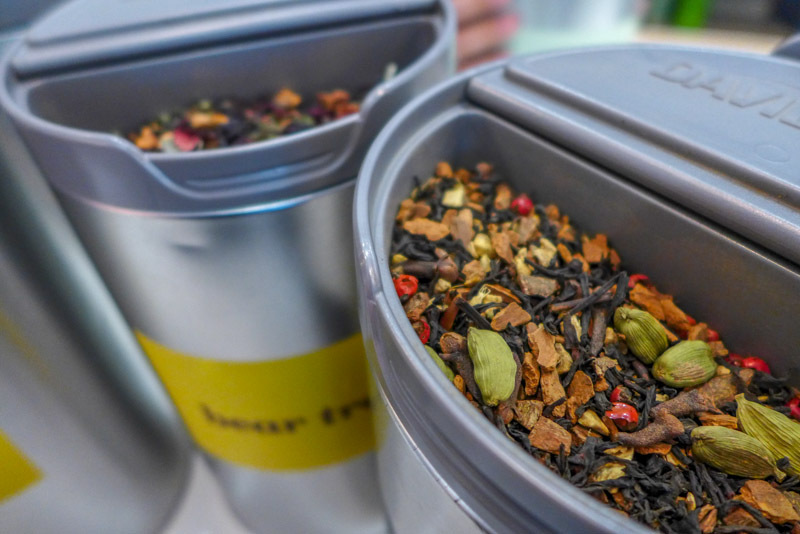 I learned that a few of the staff use the tea in their cooking too – whether it’s ‘coco-lemon thai’-infused rice or ‘coca-chili chai’-covered chicken. There was talk of using the teas in cookies, cakes and cocktails, too. Genius, eh? 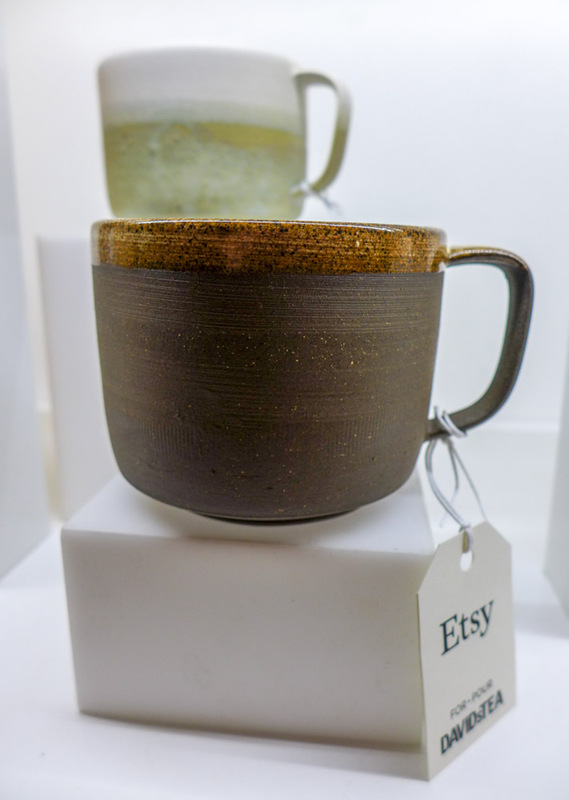 In addition, I found out that DAVIDsTEA has now hooked up with Etsy to sell hand-crafted work by a three artists, including Michelle McCaughlin, who lives and works out of Greenpoint, Brooklyn. 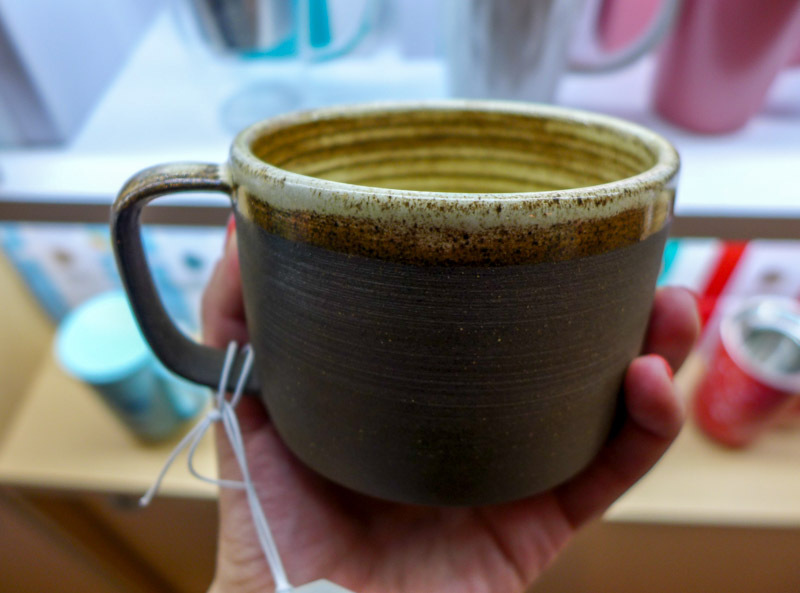 Her smooth, ceramic mugs were on show – and they were so rustic and hearty, that they made me want to pour a big mug of caffeinated warmth and snuggle down beneath blankets. 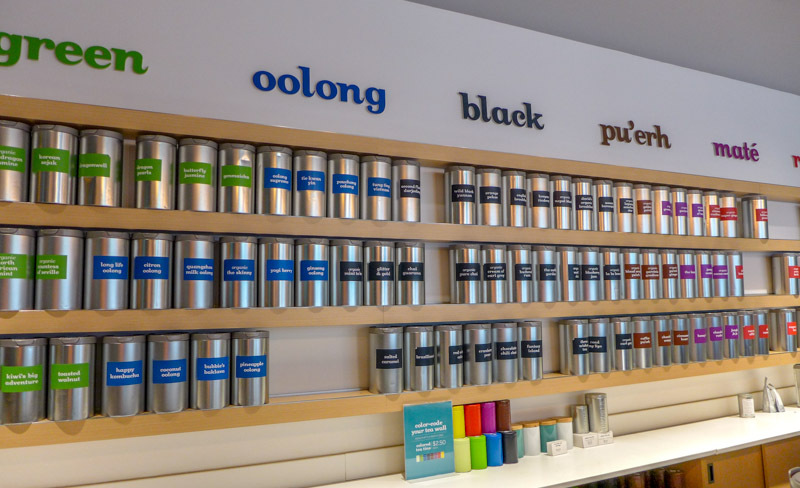 This place has definitely got me hooked on tea again – but with a decidedly North American twist. I mean, can you imagine Fortnum & Mason putting Birthday Cake Tea on their menu?! 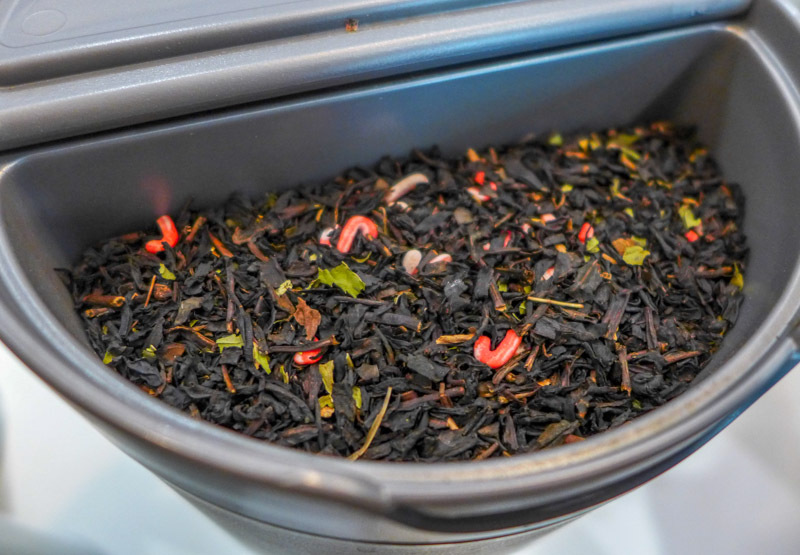 In my opinion, everyone should have Birthday Cake Tea on their menu. 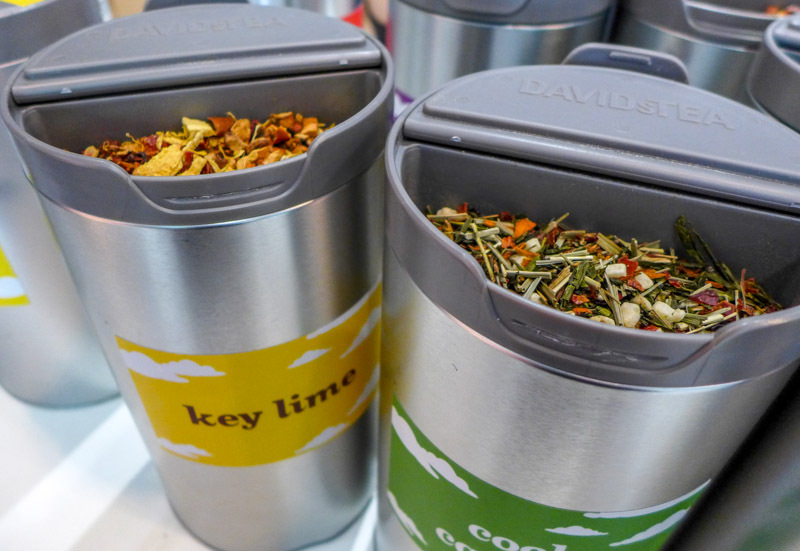 Never sure about flavoured tea but could give it a try on our next trip ….. This is soo cool! I would love to try this! Sounds very interesting even to a non-tea drinker! 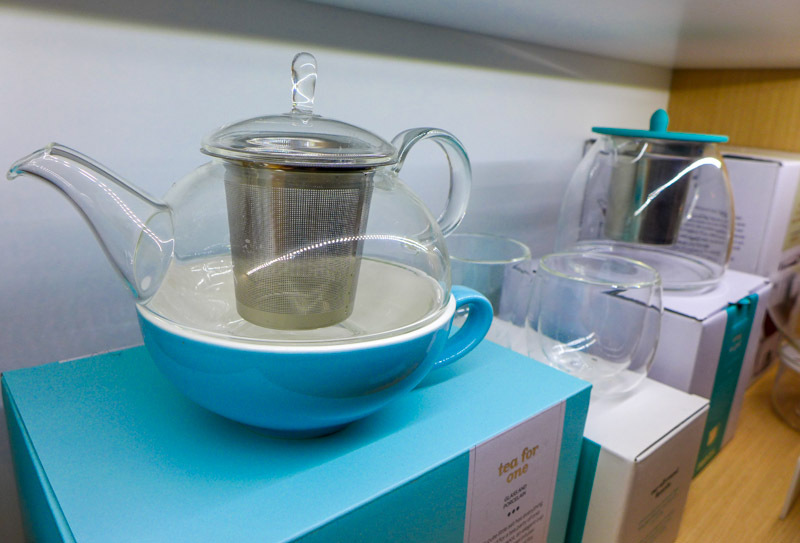 Yes, it definitely wasn’t tea as we know it in the UK!